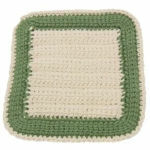 Spoon Stitch Potholder -- $1.99 A Crochet pattern from Julie A Bolduc. This potholder is backed with a piece of felt and also includes this months featured stitch the spoon stitch. This is a simple potholder to make and you could easily make a few in an evening.